Many companies use their ServiceNow data as a source for billing. This may be SaaS licenses, servers and backups in IT service management. As well as time cards and service desk tickets in maintenance and field services. Service Providers have often resorted to manual work to form complete billing data. ServiceNow configuration and transaction data is typically downloaded once a month to MS Excel spreadsheets or some intermediate databases. Manual and semi-automated billing processes are costly and slow. This is what Good Sign's ServiceNow Billing Application changes. Good Sign's intelligent automation removes manual work and errors caused by human mistakes. It offers superb financial results and revolutionary business flexibility. Who Is ServiceNow Billing for? Good Sign's ServiceNow Pricing and Billing Application is suitable for any industry providing services. All companies benefiting from recurring revenue now and in the future. Transform recurring revenue from manual complexity to automated flexibility. Modern service business is customer-centric and data-driven. Service Provider's challenges are often related to complex customer contracts and various charging models, such as fixed-fee, pay-per-use and pay-per-outcome. Combined or packaged. All fixed and dynamic pricing models are easy to manage in Good Sign's Billing. Regardless if pricing and billing is standard or customer specific. Internal efficiency and transparency is improved. Costs are automatically allocated to relevant cost center, business unit, team or project as well as partner payments. Good Sign API integration is certified by ServiceNow. Enabling dynamic billing processing and forecasting. Even real-time. Good Sign mirrors data from ServiceNow. Links service data with digital customer contracts. Each customer contract, service and asset runs with applicable pricing rules. Billing and accounting data is formed with business and customer specific rules. Business rule engine allows customer-specific pricing, cost allocations and billing intelligently automated. Removing any manual work from the process. Good Sign is built to handle dynamic business needs. New recurring revenue business models can be launched with revolutionary business flexibility and scalability unique to Good Sign’s intelligent rule-based automation. Global enterprises can rely on the scalability of Good Sign's robust software architecture and multi-layered extendable infrastructure. Simply as cloud solution. Or with specific on-site requirements. 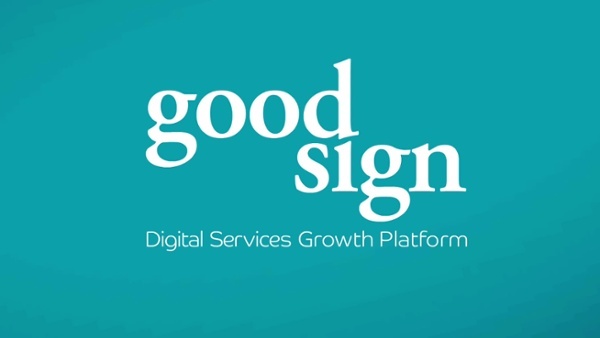 Good Sign manages billions of transactions annually. What our Customers Say about Good Sign Solutions? Technopolis needed a Service Ecosystem for Facilities and Work Spaces to automate Pay-per-use and Subscription Based Recurring Revenue. Our customers source service data from over 300 different systems besides ServiceNow. Data flow is our core. Exchanging, validating and controlling data. Data-driven services. Intelligent automation end-to-end. We can easily combine data from ServiceNow with data from travel management system, IoT platform and ERP. What your system architecture requires.